Sludgebusters has provided the highest quality, affordable San Diego County septic system repairs for over 40 years. 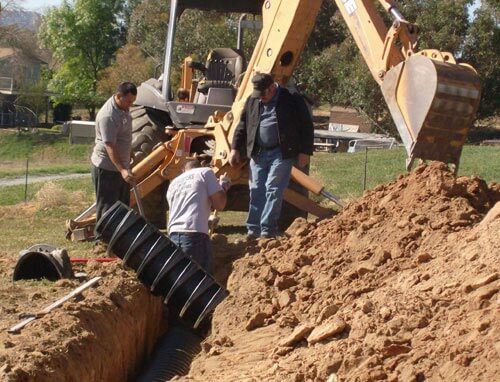 We hold a Class A General Engineering Contractor's License, and provide the most comprehensive, full-service septic system repair services available to our commercial and residential clients throughout the greater San Diego County area. We only suggest the most cost-effective solutions for your repair needs, use only the highest quality materials available, and always conform strictly to all codes governing the municipalities in which we are performing our repairs. Installing a new septic tank system can cost anywhere from $5,000 to $15,000, so proper maintenance and repair of your existing septic system is crucial to avoid costly septic system replacement. We specialize in modernizing and upgrading existing septic tank systems, as well as adding additional tanks to your existing system in order to increase your system's overall capacity. We can replace worn leach lines and outlet fittings, and can lengthen your existing leach lines and/or add additional lines to your system as needed. We perform tight line repairs both between the septic tank and the house and the tank and the septic system drainfield. In addition, we can remove and repour the concrete layer protecting your septic tank, improving the septic system's structural integrity, and we can also repair existing risers or install new ones, to ensure the maximum ease of access to your septic system. Make sure that your contractor is licensed. Your contractor must have an A, C36, C42 or B contractor's license to legally perform septic system repairs. There is nothing wrong with a novice contractor as long as they are familiar with all of the current codes and regulations governing septic systems. However, it is difficult to beat the quality provided by an experienced contractor who has been performing septic system installations and repairs in the same area for a number of years. Seek recommendations from friends and associates about contractors they have hired. Ask them if they were satisfied with the contractor's work and if it was completed in a timely manner. Price is important, but when comparing two estimates for a repair project which have a wide variation in price, it is important to take specific aspects of each job estimate into consideration: Is the contractor trying to cut costs by using substandard materials such as thin wall pipe, dirty rock, or by installing an inferior quality septic tank constructed of inexpensive plastic or precast concrete? Are all permit fees included in the estimate? Does the estimate include all required tank pumping? We had an issue with our tank on a Sunday morning. I called several places and, only Sludgebusters had an Emergency Phone Number easily visible on their website. I called the number and it was answered right away by Ed which was awesome. He was out at our place within 2 hrs (he was finishing up another job when I called) and took care of the problem. Not to mention, we had great conversations while he was working. They've got another lifelong customer here.